I was craving pad thai in a big way. Unfortunately that doesn’t bode well with my bathing suit diet, so I spent an hour pouting and looking at thai restaurant Instagrams, and then I told myself to stop being a baby and find a healthy solution. 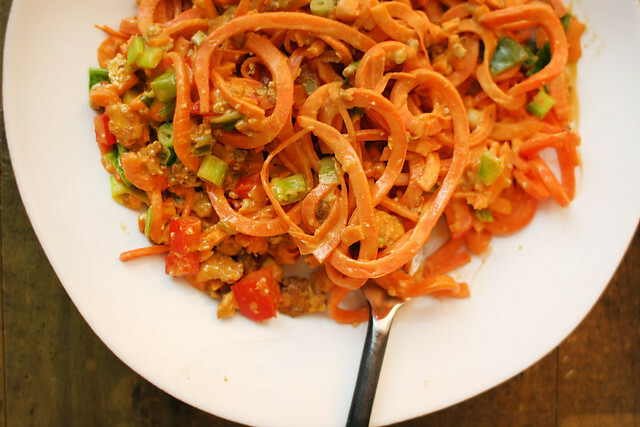 I’m back on my sweet potato Spiralizer kick, and I decided to find a way to substitute real noodles for vegetable noodles, lighten up the sauce, and still keep me sane. This recipe was so, so good (and it gave me an excuse to use my brand new wedding pan! ).Then again, I’m a sucker for anything with peanut butter..and this makes for some pretty amazing leftovers. Place the tofu in a large bowl and pour in the oil and tamari. Stir until the tofu is evenly coated then sprinkle the arrowroot (or cornstarch) on top and stir until well-combined. Spread the tofu out on the baking sheet and bake in the oven for 30 minutes, stirring half way through, until golden brown. Meanwhile, prepare the peanut-lime dressing by combining all ingredients in a food processor or a blender and blending on high until smooth. Add water one tablespoon at a time to thin, if needed. Next, warm 1 T of oil over low to medium heat in a large pot then add the garlic and jalapeno. Cook for 3-4 minutes then turn the heat up to medium add 1/4 cup coconut milk. 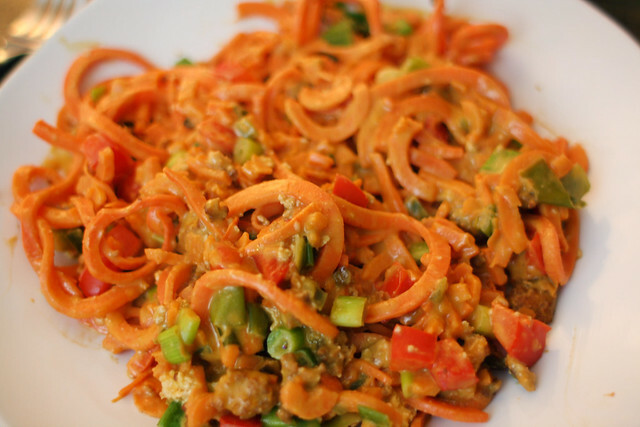 Allow the milk to warm for a few minutes then add the red bell pepper and sweet potato noodles and stir together. Cover with a lid and cook for about 5-7 minutes. Next add the peanut-lime dressing, green onion, and tofu to the pot and stir everything together. Distribute into separate bowls for serving and top with fresh cilantro and chopped peanuts. Enjoy immediately or store in an airtight container in the refrigerator for up to 3 days. 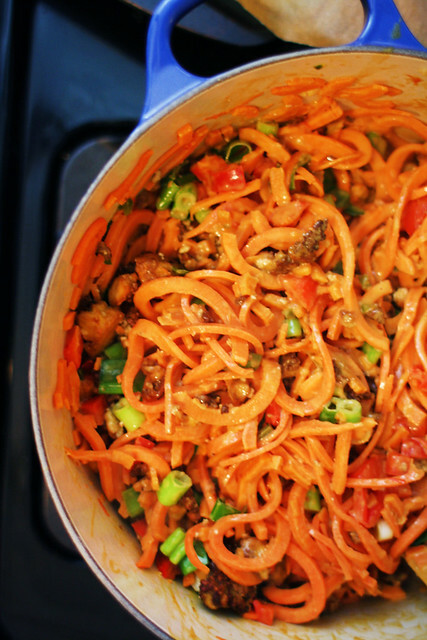 This sounds amazing.. 2 things I love: sweet potatoes and PB! Will def make this! Totally agree on the sweet potato and peanut butter, Rita! It’s a win-win combo 🙂 Let us know how it turns out. Hi Emily! I’m so flattered that you like my recipe. I’m not sure if you are aware of this but copying and pasting the full recipe without permission is copyright infringement. But I don’t mind if you want to keep the ingredients and link back to my site for the instructions.